Talk to us and learn how strategic website design and digital marketing can help you increase your sales and overall brand value. CKDigital has provided my company with good and creative work for design of our stationery and cards at reasonable cost and on time. I will willingly recommend him to any organization in need of their services. Charles work and his team at CKDigital is truly impeccable! Their flair for creativity, passion for detail and attentiveness produced a truly international standard website for our firm. He displayed tremendous patience and listened to every improvement throughout the project. A good well done! Charles Dairo through his firm CKDigital did a marvelous job in turning around the looks of our company website. Bringing it up to the standard prevalent with modern day websites albeit with its own distinct look thus increasing traffic to the website which we are most grateful for. 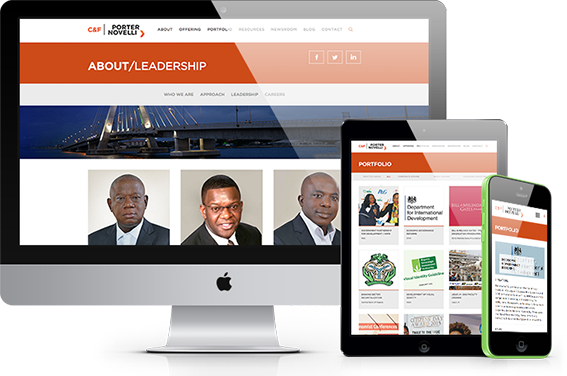 Through CKDigital, the turn around look of our website has further enhanced business activities for us. Kudos to the CKDigital team. They come highly recommended. You may not realize how much having a splendid website will contribute positively to your business till you let CKDigital make that turn around for you. Jennifer Edozien, CEO MSJ Events & Marketing Ltd. I was referred to Charles a few months ago by a friend to build my website. I must say I was impressed from start to finish. Charles paid close attention to my goals for the site and added his own touch to it. He didn’t mind making amendments and made sure I was carried along at each stage. The finished product is a unique site that stands out from the rest. I will certainly recommend CKDigital to friends for several reasons including price. CKDigital did outstanding work for Zircon Marine on branding, webpage design and maintenance. I was particularly impressed by their attention to detail and creativity – really world class delivery for a group of young folks. During a business transformation project, CKDigital was engaged to provide a website redesign and e-commerce solution with ability to pay and deliver globally. CKDigital was given strict requirements and project scope and delivered superbly. I look forward to working with CKDigital on future initiatives. A few months back, Dreamtreats needed to develop a cake website that would meet up to international standards, attracting customers both home and abroad who needed to celebrate their loved ones. We went online and discovered CKDigital, a web design company with fantastic customer service and rapid turn around time. A call, a meeting and several emails later, we have the website of our dreams and much more. We also have a committed team who have got our back and literally taken ownership of our vision, expressing it via creative web design while ensuring that we are well positioned in a technology driven world. Thank you CKDigital. We look forward to accomplishing more milestones WITH YOU!! Finding and working with Charles Dairo and his team at CKDigital was all I needed to transform the dreams for my company into a perfect and well refined reality. We can today boast of a world class website, amazing branding and more. Very professional and prompt service! CKDigital was very professional, and diligent in their design and development of our website. The project team was courteous and attentive to detail. CKDigital provided a superb service in designing and building our website in line with specification, in a timely and professional way. We would thoroughly recommend CKDigital to anybody looking for a reliable and efficient digital partner. We also utilized CKDigital’s SEO expertise which has helped us climb Google rankings and helped us exceed performance expertise. Highly recommended. My experience with the CKDigital team was amazing. The team exceeded expectations by constantly finding ways to suit our preferences in our website design. I found the team very hardworking, working late in several nights for us to meet our deadline. The after-launch support has also be very good so far. I think CKDigital is a fantastic firm that delivers great value to clients. The entire CKDigital team were ace in the delivery of our website. Their commitment to surpassing expectations and delivering a satisfactory job has sealed my faith in their professionalism and capability. So far their after-launch support has also be very impressive. Thanks Charles and Team. Great service! Second time using them and I’m quite impressed. Greatly improved from the first experience. With respect to the well executed web designing and hosting contract. I , Richard Thomas Nwachukwu, on behalf of Riton Publishing Co. Ltd., profoundly express our gratitude for a job well done. I reckoned CKDigital’s uncommon commitment to excellence, its premium demonstration of mastery of the art exemplified in its reflex apt understanding of our taste and yearning for a contemporary state of the art themes that match global standard– CKDigital delivered all jobs with little stress on us. I also acknowledge CKDigital’s very responsive courteous customer support team, cost friendly packages and strict adherence to the project time it indicated. I look forward to contracting more deals to CKDigital and I will be glad to recommend CKDigital to our affiliates if need be. Vitafoam Nig. Plc has worked with the CKDIGITAL team for about 5 years now, and over the years, they have become our trusted digital partner. They consistently deliver great results, and always work hard to ensure our project objectives are met. Their support team is also exceptional, always ensuring our website is performing optimally and giving us insights regularly. I gladly recommend the CKDIGITAL team. CKDIGITAL spares no effort in achieving companies’ objectives, with very dedicated and hard working team members. Team CKDIGITAL has been quite impressive in delivering for us at RedStar Express PLC, a modern, clean and standard website and a mobile app for our customers. Despite the short timeline given to them, they were able to come up with flawless designs and an agile solution that better propagates our business. I highly recommend this great team.